Blizzard Lighting's Blade™ RGBW Moving Head Beam combines blinding output, surgical precision and a razor-sharp 1.1 degree beam to dazzle your audience as it slices through the air! 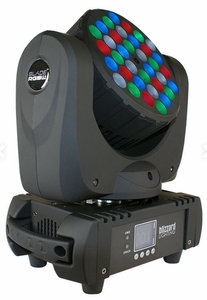 Blade™ RGBWPacked with 36 5-Watt CREE® Red/Green/Blue/White LEDs and coupled to an all-new, incredible 1.1 degree beam angle optic system, the Blade™ RGBW is an incredible aerial performer packed in a tiny, lightweight package. Plus, thanks to advanced motor technology and innovative design, the Blade™ is the fastest, most accurate moving head we've ever offered... by far! The Blade™ is a snap to program and easy on the eyes, too, thanks to its full-color LCD-TFT display with icon-based navigation. Plus, the fixture has plenty of extras usually only found on fixtures with a much higher price tag. PowerCON™ compatible power in and out connectors make for secure power connections, user selectable 16-bit dimming, defeatable pan/tilt correction with trim adjustment, auto standby after DMX signal loss and fixture ID addressing are all included! Finally the Blade™ RGBW easily converts from a dazzling beam fixture to a versatile 8.8-degree soft-edged wash fixture by attaching the included diffuser lens. It's like having two fixtures in one! So get ready to slice and dice, and pick up your Blade™ RGBW's today!